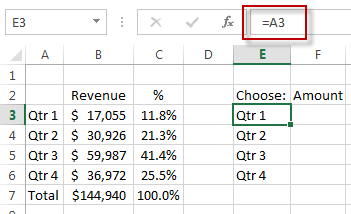 In case you were wondering, here is my solution to last Friday’s Excel Challenge. My solution is below. 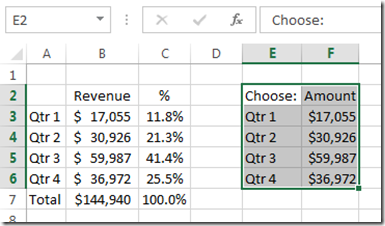 Maybe you can use these techniques in your next executive Excel Dashboard. Also, below you will find a free sample download file, video tutorial are step-by-step instructions. 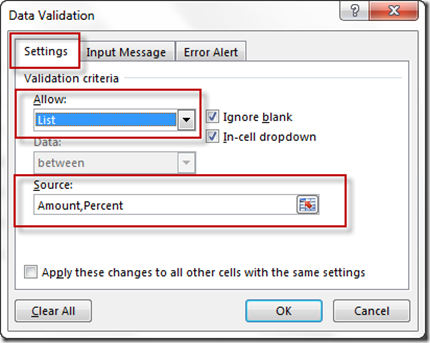 I want my dropdown list in cell F2. So select F2 and then go to your Data Ribbon and choose the Data Validation menu and then choose the “Data Validation…” menu option. 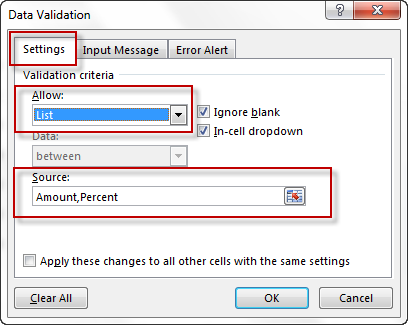 Then from the Settings tab on the Data Validation dialog box, choose “List” from the Allow picklist and type in “Amount, Percent” in the Source text box. Now that we have made our picklist, we need to create a range of data for the chart that we want to create. It is pretty simple because it is just an IF statement for the chart data that we want to show based on the pick list data. 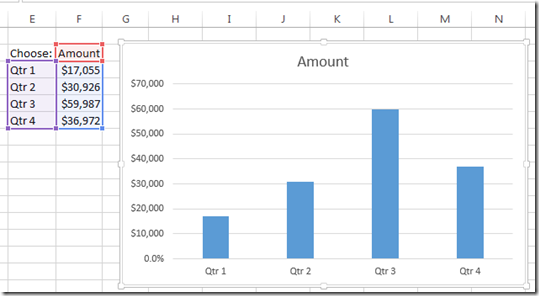 Now you are almost set to make your Excel chart, but there is one more step before we make our chart. Now before we make our chart, if we perform this step, it will save us tons of time. This is the key to this demonstration as several other techniques that I and others tried didn’t work (even though I thought they would work). It is a simple, but very cool step. Now that you have the chart data range selected, go to your Home Ribbon and then select the Number Format picklist in the Number Group. 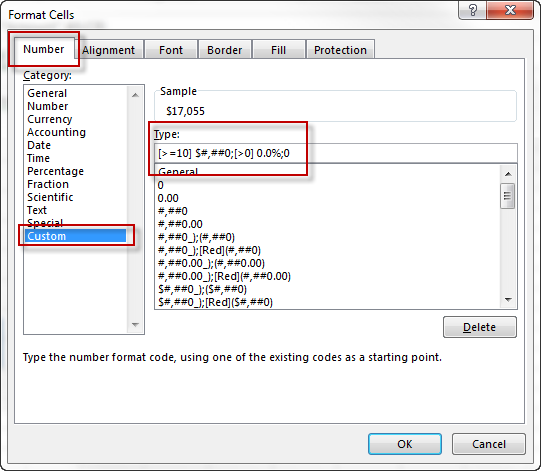 Then from that menu, select the “More Number Formats…” option. and then press the OK button. 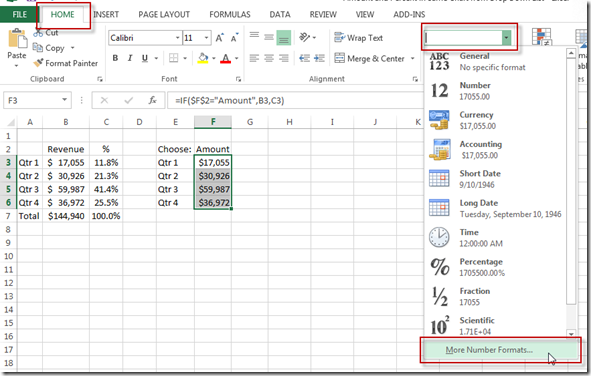 This will change the number format of your selection to a Percent when the values are less than 10 and change them to an dollar format when the are greater than or equal to 10. Now you are all set and there is just one step to complete the project. 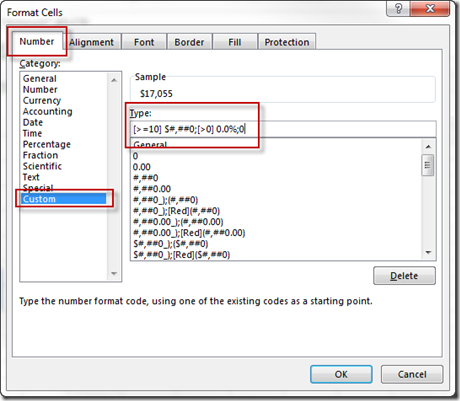 Now that we have created our custom number format for our chart range, we can create our chart. And the chart will take the number format that is in the range. So when you change the picklist to Amount or Percent, the chart will change accordingly. 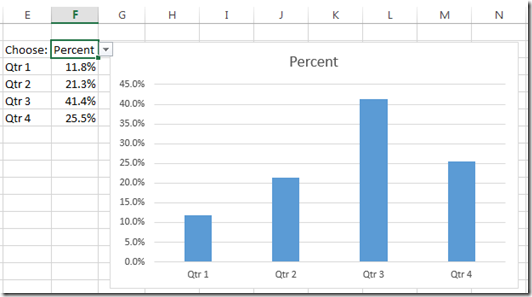 and then go to the Insert Ribbon and choose Insert 2D Clustered Column Chart from the Chart Group. Wow, that was easy, but it was my 3rd try at making this chart. And other rock stars like Don and Pete struggled with it as well. 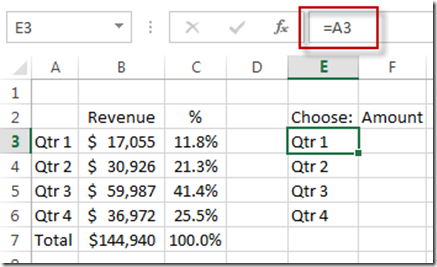 So it wasn’t as easy as it seemed, but it means that where there is a will, there is most likely a way in Excel. Download the free sample file to see how this chart was made. 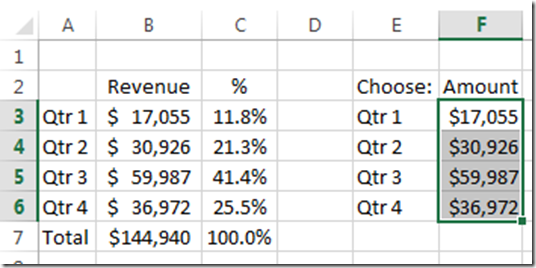 Thanks for an awesome year on Excel Dashboard Templates and thanks for being a fan!! If you want to make sure you get the next post delivered directly to your inbox, please subscribe today. All of the $ amounts are below $10, so the formatting thinks they are %. Don, Good point. So we could change the formula to >100 and it still may work for most instances. Thanks again! My example was just one case. Another would be, if dollar amounts were “Net Income” and not revenue. 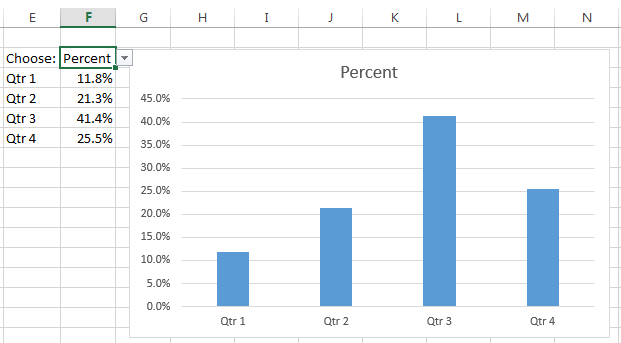 If the firm losses money in any quarter, the formatting goes away for losses over $100. I’m not trying to “beat a dead horse”, just showing why I decided against formatting. Maybe there is a formatting that gets around this, but I could not figure it out. 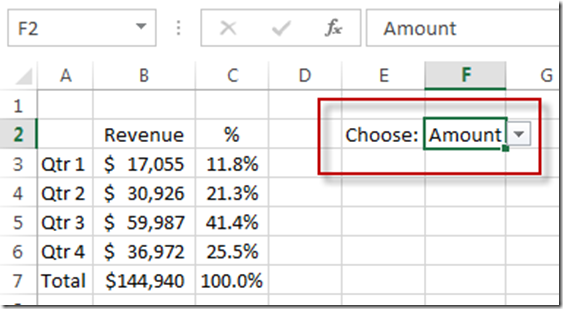 Hi Sunil, the brackets tell Excel that if the value in the spreadsheet cell >=10, then format the cell with $ and if not then it goes to the next formula (you are only allowed 2). 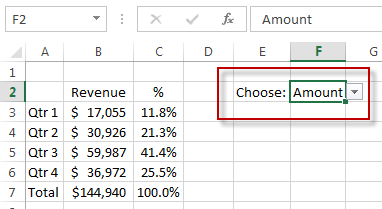 The next statements checks to see if the cell value >0 and if so, then format the cell as a %. 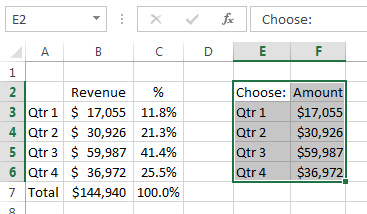 The next statement states that if the cell is equal to 0 then format it only has a 0. 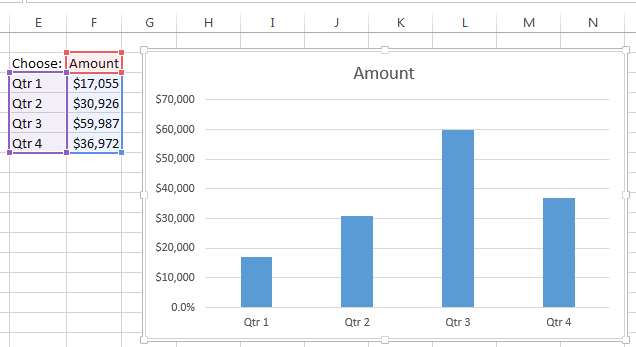 This post may help explain a little more about custom number formatting: https://www.exceldashboardtemplates.com/how-to-format-chart-axis-for-thousands-or-millions Hope this helps.